*Add a qualifying DeWALT bare tool to your cart and the free item will automatically be added. Limit 2 free items per customer. Offer valid until 11:59pm ET on June 30, 2019 or while supplies last. No adjustments to previous purchases. Subject to change without notice. 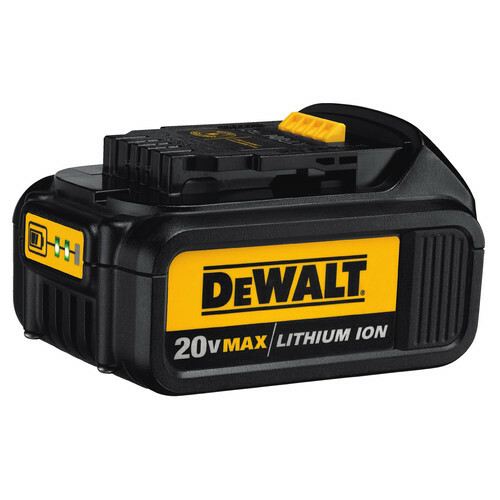 The DCG412B 20V MAX Lithium Ion 4-1/2 in. / 5' in. Grinder increases productivity with features like Quick-Change wheel release, convenient trigger switch with lock-off button, and extended run-time battery. I bought this tool for cutting metal siding for 2 new storage sheds that I built for my dock. It worked great with plenty of power to cut the metal. I have also used it to cut off 1/2" bolts.Understanding its a battery tool, its great for cutting a variety of projects. I'm not sure that its the right tool for heavy duty use. Another great tool by the wall. Battery technology is amazing. This tool is my go to for any and all cut-off needs. Won't go on a jobsite without it. I added this to my Dewalt tool list and it was the best thing I ever did. Working in my garage this grinder always has a cutoff wheel on it. Zip your done. What hacksaw, its in its place in the tool box. This is the best way to go. The grinder works well for short duration, light duty cuts and grinding. Don't count on it for anything that requires run times of much more than a couple of minutes before resting the same amount of time. I was away from my shop and did not have my trusty old corded grinder with me. Lowes was close to the job I was on. I had been wanting a cordless, brushless model, but Lowes did not have that model in stock. Since I had to have a grinder I got this one. It works, but like the previous poster mentioned. It eats batteries. I have two, 2 amp batteries that came with my brushless drill and impact driver set. One of those batteries will run this grinder less that 10 continuous minutes before it shuts off. By that time the battery is so hot that it cannot recharge until it cools. The second battery runs down and heats up before the first battery has cooled enough to charge. So, now I have 2 batteries too hot to recharge. This heat level is not good for the battery life either. One of my 2 amp batteries failed to ever recharge after a couple of these cycles. Dewalt did replace it free of charge, but you have to pay for shipping. So I was without it for over a week while I got around to getting it replaced. If I let a battery cool but not recharge, it will run my drill or impact driver for a significant time before requiring a charge. I would hold out for the brushless model if I could do it over. If you have extending grinding to do, get your extension cord out!!! Very powerful grinder, easy to change discs and easy to handle. Tons of power and will make quick work of most metals. It comes with a grinding wheel so its pretty much ready to go out of the box (if you have battery packs. Tool performs well, but you need to have at least 2 heavy duty batteries, i was grinding concrete and even letting the tool glide over the surface that i was grinding, the battery last only 15 min and even letting the tool rest a minute o 2. Great for a quick cut or grind of metal without dragging out a cord. We also put cut off wheels in it and use it to cut rebar, bolts and nails. Is this compatible with the xr 20v battery. BEST ANSWER: Yes, XR and MAX batteries are compatible. The instructions (and this web site) state that the tool comes with a Type 1 cutting guard. But my cutting guard is open faced, not two sided, which I understand to be the Type 27 cutting guard. I also noticed that reviews from another web site state that they received this tool with a Type 27 guard. Which guard did yours come with? BEST ANSWER: Not the one in the CPO picture, the more one sided open style, and I did buy 2 at 2 different times. BEST ANSWER: No, I would not recommend that unit to buff a boat. The Dewalt DWP849x would be a much better option for what you are trying to accomplish. Simply no, not enough torque or battery life. Need a standard corded tool for that kind of load. will this work with the 20v max lithium ion slide in battery-DCB203 Battery pack?? wil accept a 5 inch blade? BEST ANSWER: That unit will not accept a 5 inch blade.